My favorite ride at Disneyland is Mr. Toad’s Wild Ride. Well, today, Dean and I did Mr. Toad’s Tour of San Francisco. 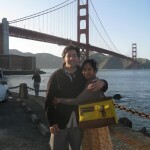 It’s a 90 minute tour of North Beach, Jackson Square, Chinatown, Pacific Heights, Nob Hill, and Fisherman’s Wharf. After I got back from Sedona and the cool Pink Jeep Tour, I decided I needed to know more about my own city. We got a kick out of the non-stop trivia from the former radio broadcaster as he drove us around in today’s gorgeous weather. I haven’t done any of the other city tours so I can’t do a comparison, but I really liked it. I liked that the native tour guide had a lot to say in a short amount of time. He kept us laughing for sure as he pointed out where movies were filmed and where celebrities lived.